Barney Fife (Don Knotts) and Andy Taylor (Andy Griffith) are frustrated in their dating lives. Every time they try to be alone with their respective girlfriends, Gomer (Jim Nabors) show up uninvited and, being Gomer, doesn’t catch the obvious hints that the couples would like to be alone. Since they’re friends with Gomer, they don’t want to hurt his feelings — and fate seemingly intervenes with the arrival of Thelma Lou’s homely cousin, Mary Grace (Mary Grace Canfield–‘Ralph Monroe’ from “Green Acres“). Gomer is excited about the date, buying new shoes, etc. But he’s clearly getting cold feet as the time for the dance draws near, since he’s never been on a date before. Shortly after they arrive, Gomer bolts out saying that there’s something he needs to go do. Mary Grace pretends to have a headache as an excuse and insists that the others go — resulting in a very funny moment where (off-screen) Thelma Lou hits Barney in the back seat of the car. 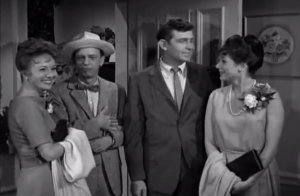 Once they arrive at the dance, the girls also have “headaches” and so they return to Thelma Lou’s house. Once there, they find Mary Grace dancing with Gomer. He ran out to buy a corsage for her upon seeing that the other girls had one, and he didn’t want to have her feeling left out. ﻿ A Date for Gomer is an episode more sweet than funny, but definitely worth watching, and available on The Andy Griffith Show season 4 DVD.